Gucci's glamorous, refined aesthetic has set the standard in fashion for decades. 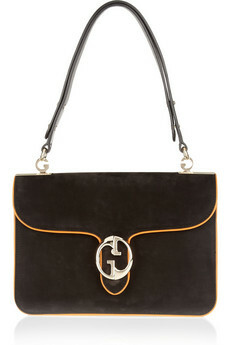 This vintage-inspired 1973 bag combines the best of its past and very contemporary elegance. The combination of materials on the 1973 is total genius. I love the rich tone on the black suede. It's very chocolatey, which suits the smooth texture beautifully. The orange trim is perfect. It hearkens back to the 70s in a subtle way. The color says retro, but the quality of the craftsmanship is totally modern. The design of the bag is also really spot-on. The simple shape gives way to a tooled flap that is curvy and sleek. I'm not really sure that I love the way the clasp hangs on the bag, though. The way the lines of the flap intersect with the lines of the logo sort of crowds the front of the bag. But I really do like the logo strap attachments. They add a little je ne sais quoi. The $2,330 price tag of the 1973 is certainly not unheard of in the designer arena, but I'm not sure that the not quite streamlined look of the bag warrants it. The Anya Hindmarch Jackson Shoulder Bag, a larger, daytime alternative to this bag.